***If you can't attend the party you may place a pre-order to be processed the day of the event. Call 512.382.9150 or email us with your order request. Clients may purchase multiple cards. All cards will have a 6 month expiration date from date of purchase. Rollover policy available for all sale cards. Take a class and be entered to win DS swag and possibly the Grand Prize! Shop! We will be offering 15% off 10 & 20 class cards as well as full priced merchandise. Enter to win our Grand Prize giveaway ($784 Value! )- everyone who comes to the studio for our party and/or pre-orders a class card will be entered to win. 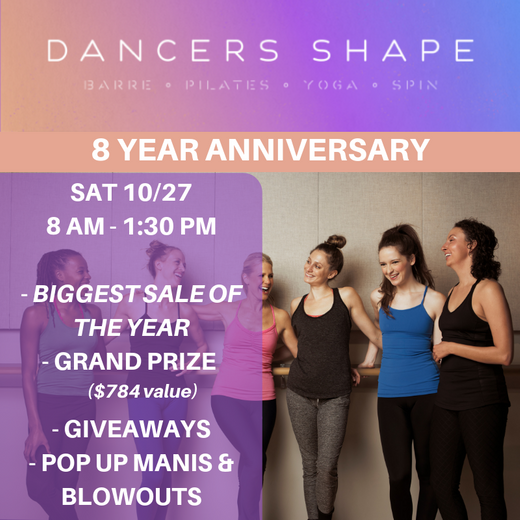 We are thrilled to be celebrating 8 years in business and we hope you can join us! We're also doing weekly Facebook / Instagram giveaways in celebration, so be sure "like" & "follow" us. One lucky winner each week will win DS Swag! DON'T FORGET IF YOU CAN'T MAKE THE PARTY YOU MAY PRE-ORDER your class cards and be entered for a chance to win the grand prize. Pre-orders require a current account and credit card on file - you may set an account up through our online scheduler. Call 512.382.9150 or send us an email with your order request (to be processed day of sale) or if you need help setting up an account. No need to miss these great deals with so many options!